Paragliding is a unique way to soar peacefully and freely with the birds. You are completely self sufficient from take off to landing and all your equipment fits in a rucksack and can easily be carried on your back and fits easily in a family sized car luggage compartment. Despite not having an engine it is possible to soar freely for hours and over long distances gaining thousands of meters altitude simply using nature as birds do by rising currents of air. 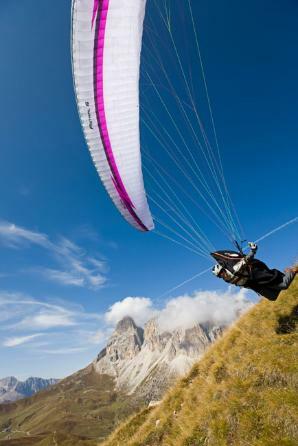 Paragliding was thought up in the 1980’s initially with low performance Ram Air Parachutes, enabling the flyer to take off from Mountains and Hills to maintain their airtime. Over time with advances in technologies, materials and with the use of Computer Aided design (CAD) we can fly aerodynamic, efficient and safe paragliders. At Fly High Sky Sports we offer taster lessons through to EPPA Pilot certification. For the beginner this gives a gentle introduction into the sport of Paragliding at our exclusive site near Canterbury in Kent. The course consists of Introduction and Safety briefing, Safety Landing training, Paragliding terminology, Ground Handling, Launching techniques both reverse and forward and several ground skimming flights, debrief session and look forwards too. On successful completion of the EPPA Pilot syllabus you will be granted an EPPA Paraglider Pilot rating. Training includes Tandem flights, towed flights (if required), Hill take offs, all tuition and use of our equipment. To gain the Pilot qualification you will be required to participate in necessary lectures to gain competency. Lectures include; Theory of Flight, Airmanship, Air Law, Meterology, Navigation, Emergencies and equipment maintenance. This is a pay as you go course and is priced per day with no up front fees. Days can be taken separately due to ones availability and weather resulting on restrictions to fly.